With Jack being the first grandchild, and second great grandchild everyone is in love with Jack. With this we thought we would get everyone a small gift from Jack, but what could we get which would be personal to Jack but not overly expensive. Then we decided to make some Christmas plates as gifts, obviously not for the purpose of eating from. We decided we would put Jack's little hand and foot print on from what he looked like on his First Christmas and be able to reflect back on in years to come. This idea, became a small problem when we came to put the handprint on as Jack doesn't like his hands being pressed flat anymore, problem resolved we did two foot prints. Firstly we went to a local store and brought some plain white plates which were big enough for the design to go on. Also getting some paint from a craft store, for this we purchased acrylic paint. Secondly we laid out the area in which we would do this with some old newspaper, a towel and a bowl. Also a sponge to apply the paint with. We then striped Jack down to just his nappy as the thought of getting lots of paint out of his clothes was too much, he's a 9month with his hands in everything! Placing the plate on the newspaper and my partner holding Jack, we then placed a small amount of paint onto Jack's feet to do the first foot print. At first we tried with Jack standing onto the plate, but we did however find it easier to sit Jack down and take the plate to him. Note. If you make a small mistake or your child moves their feet or hands, you can easily wipe it away whilst still wet with a baby wipe or a sponge and water. At this point we then attempted to do Jack's hand print but this is when we realised he wasn't going to place his hand flat. Again, this would be done in the same way as the foot. 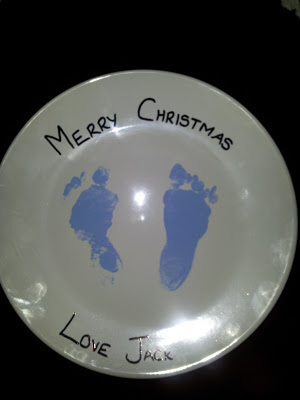 Therefore, we did Jack's other foot and placed it beside the first one on the plate. The plates should then be placed to throughly dry. When the plates were dry, we then wrote a message around the edge of the plates using a fine tip marker pen. We also drew around the foot prints on some of the plates, but left others as natural prints. 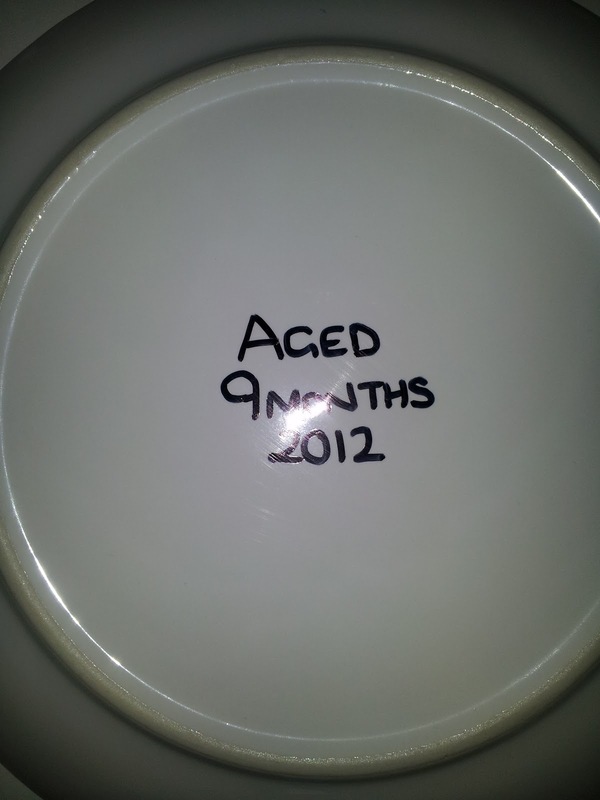 I think these plates are lovely gifts which will be throughly enjoyed by the family.